In 1966, when liquid crystals did not exist, we took notice of polarizing plates, an optical element, and began our in-house R&D, production and sales. As time passed, we began doing the same for wave plates, which is now adopted by major microscope manufacturers, becoming a confident product of our company. In 1996, we developed, manufactured and sold original strain tester using our own polarizing plates and wave plates. Luceo has always made progress and evolved by having flexibility to the change of times. We aspire to become a niche-top company in these fields by continuing to develop products in our brand. ・ Polarimeter/scope is a testing device that evaluates residual strain of glass and plastic. ・Conventional polariscopes depend on human visual sense, experience and/or intuition to measure the amount of strain or make judgements, so with every measurement, the test results varied depending on the operator’s experience and the level of physical fatigue or eyestrain. 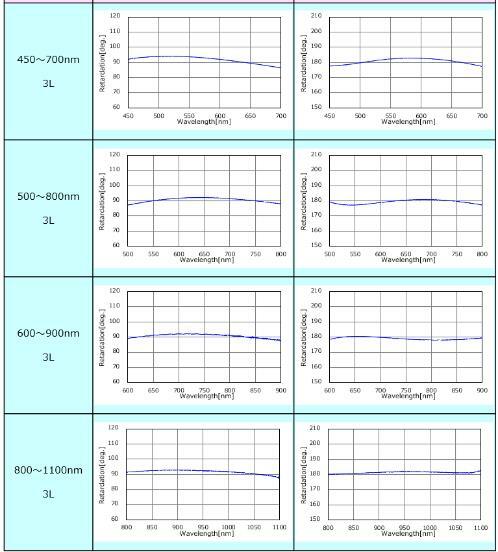 In contrast, Full Automated Polarimeter LSM-9100W is a device that quantitively measures the strain (retardation) peculiar to the sample two-dimensionally in the range of 0-3000nm, regardless of who or when it measures. ・Invisible to the human eye, the internal residual stress of a transparent object can be thoroughly and quantitively measured by anyone with just one click. ・By incorporating internally manufactured high-quality polarizing plates, we were able to adopt RGB linear polarization method using 3 wavelength data that makes it possible to obtain highly accurate result of repeatitive accuracy by 1nm retardance. ・The credibility of this testing equipment is backed by its business record with major glass and lamp manufacturers, as well as lens makers, to name a few. ・Dedicated software and PC are included in the product package. ・The physical unit of a strain, the retardation (phase difference), is measured quantitatively (in nanometer units). Furthermore, retardation can be converted into stress (MPa or kg/cm2) by entering the sample’s photoelastic constant and thickness. ・By feeding back the measurement into development, it can contribute to reducing defective parts. It is also effective in setting mold conditions as wells as process management of resin molded parts. ・Due to its wide measurement area of φ150 mm, it is best suited for measuring large samples. 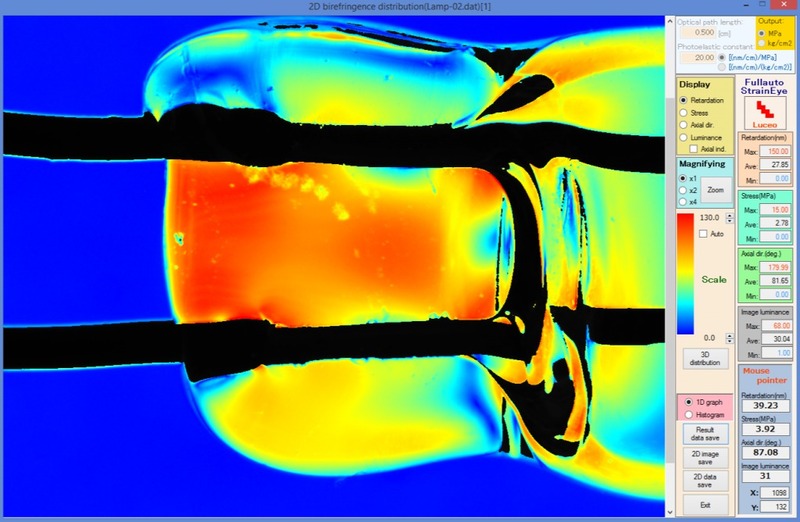 ・It is capable of measuring large strain of glass or plastic depending on the generated amount of the strain. 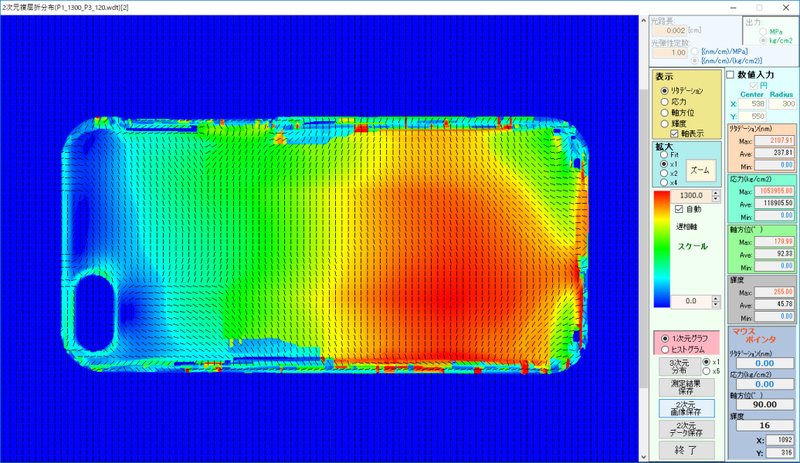 and the axis orientation of the slow or fast axis. ・The measurements will be displayed in 3D view. ・The double extension lens (optional) is available as attachment, making it convenient for users who want to measure even smaller samples. ・Other main features are equal to Full Automated Polarimeter LSM-9100W. ・Full Automated Polarimeter LSM-9000LE is capable of measuring retardation (phase difference) of 0-130nm with high accuracy. ・Effective for measuring samples with relatively low strain such as glass objects. ・Because of its larger measurement area of 175mm x 175mm, this type is effective for measuring the strain of relatively larger samples. ・LSM-9000S is a Full Automated Polarimeter that is capable of measuring retardation (phase difference) of 0-130nm with high accuracy. 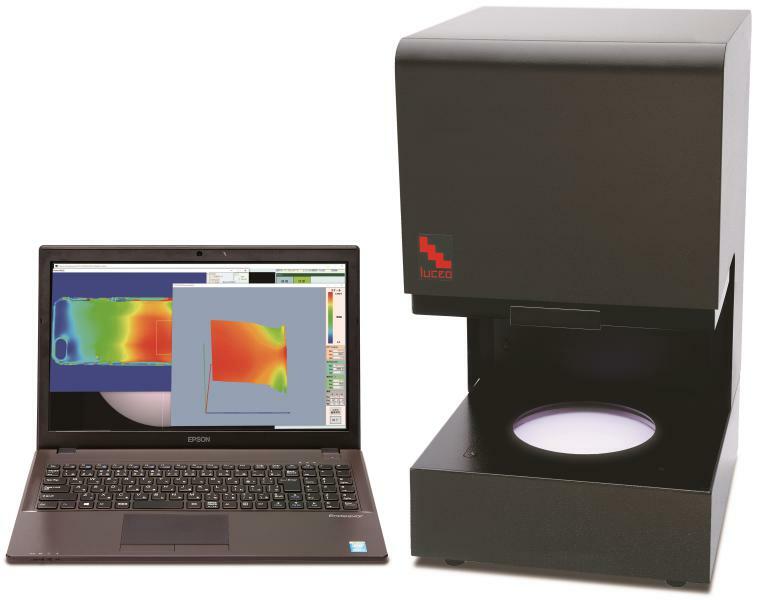 ・Accurate measurement is achieved by its 6x zoom lens which optically magnifies small samples. ・The single wave plate is capable of achieving constant phase difference with high precision in the range of 450nm to 1,100nm with its super broadband range. ・Sizes larger than crystals can be manufactured. It also supports various sizes and shapes (square, etc.) (~φ100mm、~□100mm). ・For applications requiring multiple wave plates, SB-RETAX will provide the solution with just one plate. 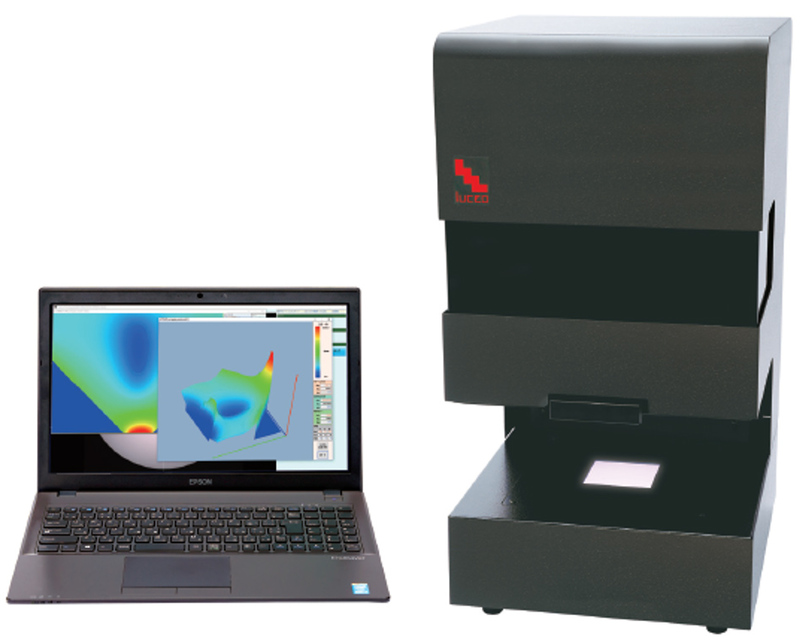 ・Enables faster data synthesis and miniaturize device development. For example, solar observation requires multiple wavelengths simultaneously and each wave length data is compared and synthesized for analysis. Conventional wave plates that support single wavelengths cannot perform simultaneous observations, so time lags occurred when comparing data and extended time is required for synthesis. By having a single wave plate perform multiple observations simultaneously, it provides accuracy and shortened work time. In addition, when switching wave plates, space within the device itself or the structural space would be required, but with SB-RETAX, these spaces become unnecessary, which could lead to miniaturization of devices. ・Contributes to the development of truly innovative ideas. 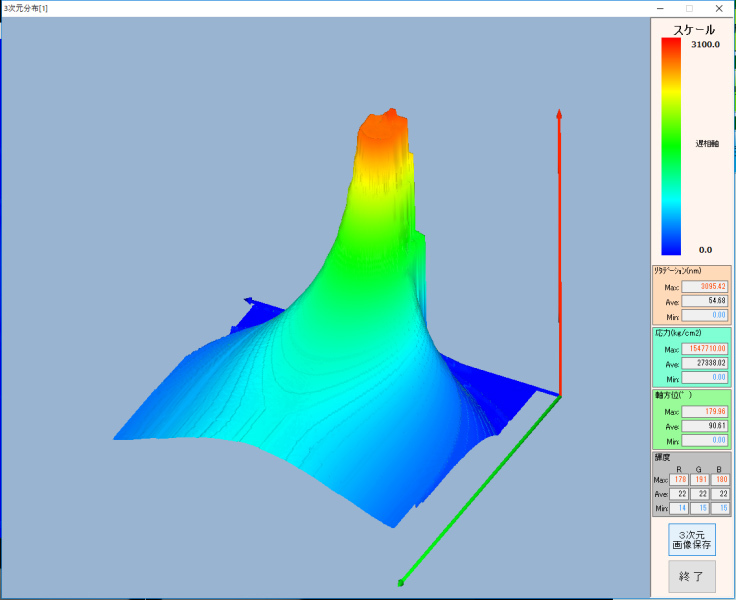 ・Simulations allow adjustments to any wavelength range and retardation (maximum wavelength range of 450 to 1,100nm). ・Customized orders available from just 1 pc. ・Because we perform the R&D and manufacturing, customers may select from a variety of standard products. The supported wavelength range for visible light is 400~680nm and near infrared is 780~1,600nm. ・In addition to standard products, we offer customization from just 1 plate. 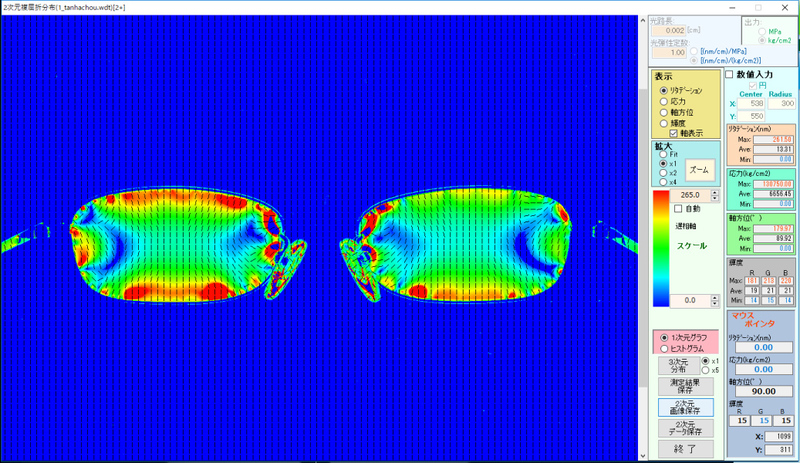 Improved in-plane color regularity: ~ φ50mm、~□50mm×2t (Axis parallel to edge). 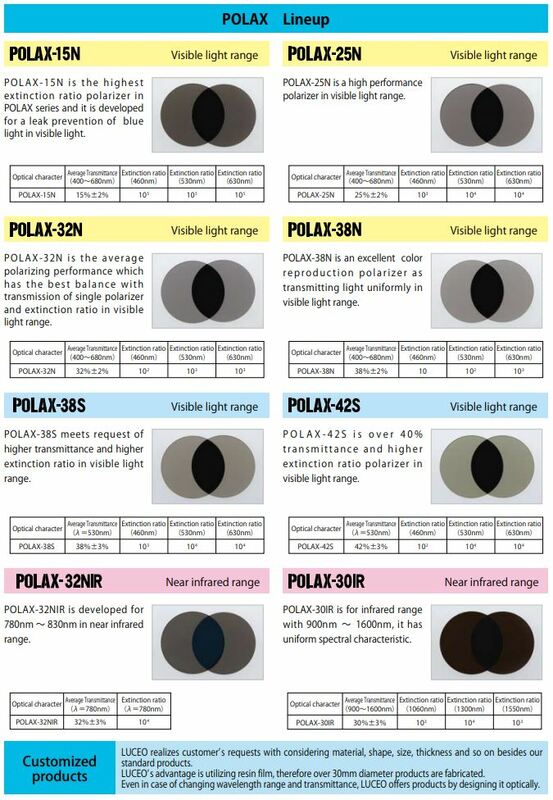 Our company was the first to develop polarized plates that cuts-off short wavelengths (prevention of blue-leak phenomenon). Even today, we are improving our technology. LUCEO quality is recognized worldwide as our products are integrated into products of globally famous major microscope manufactures and national astronomical observatories. ・This polarizer has a film laminated in between the glass substrates. It is a known fact that, generally, it is difficult to attain parallelism and surface quality with laminated products, but our polarizing plates possess high quality parallelism and surface quality, as well as transmitted wavefront quality. ・You may select from the 2 types of wave films we offer for your needs. ※The available size and thickness will vary depending on phase difference and optical axial direction. ※Custom made orders are available for coating types, sizes and shapes. ・Circularly polarizing plate is made by laminating polarizing and wave plates (1 / 4λ phase difference). ※As phase difference becomes larger, than the available size becomes smaller. 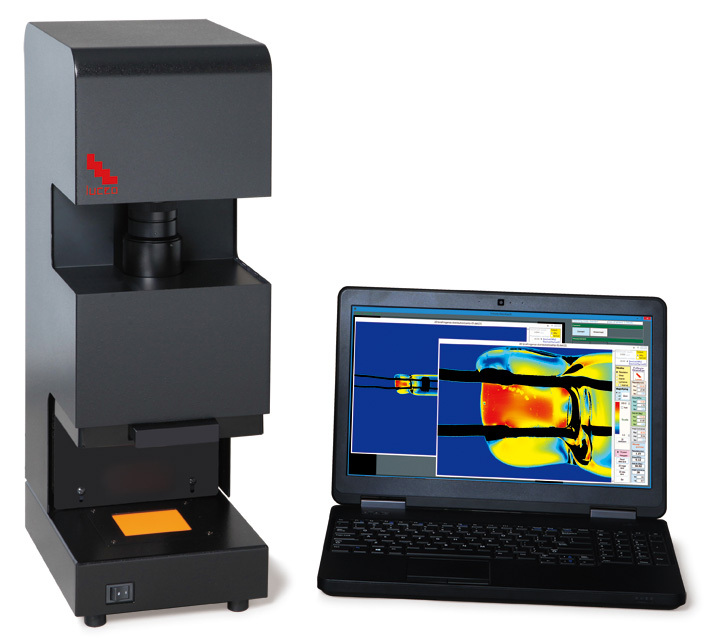 FSM-6000LE/IR/UV are products that measure compression stress of glass surface and depth of layer quantitatively by non-destructive with computer analysis. 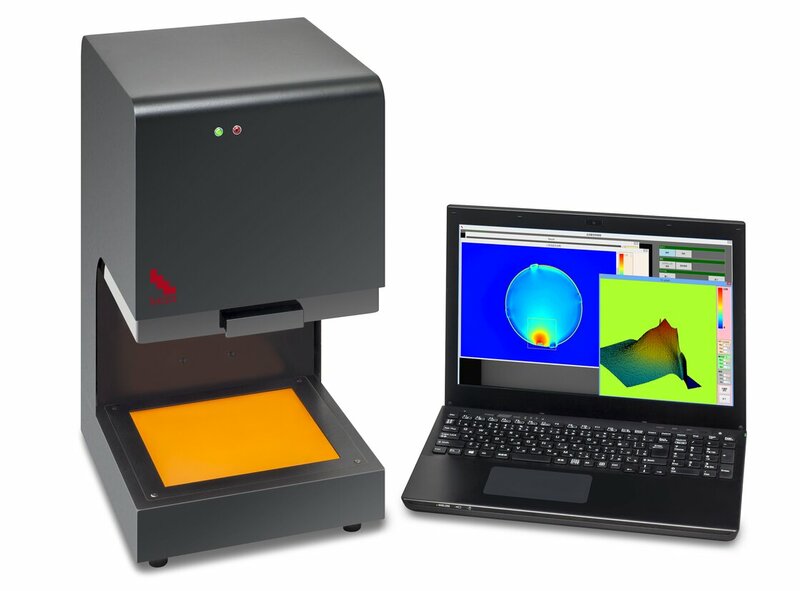 This device makes it possible to get accurate result easier regardless of who measures it. This machine doesn’t need operator’s skill. 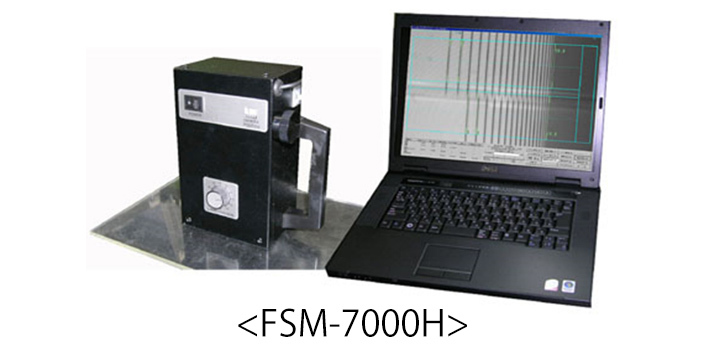 FSM-7000H is a handheld model of surface stress meter. It’s suitable for measuring compression stress and depth of layer for larger glass plates. Both FSM-6000LE/IR/UV and FSM-7000H evaluate chemically tempered glass and thermally tempered glass,furthermore double ion exchanged glass,automatically. 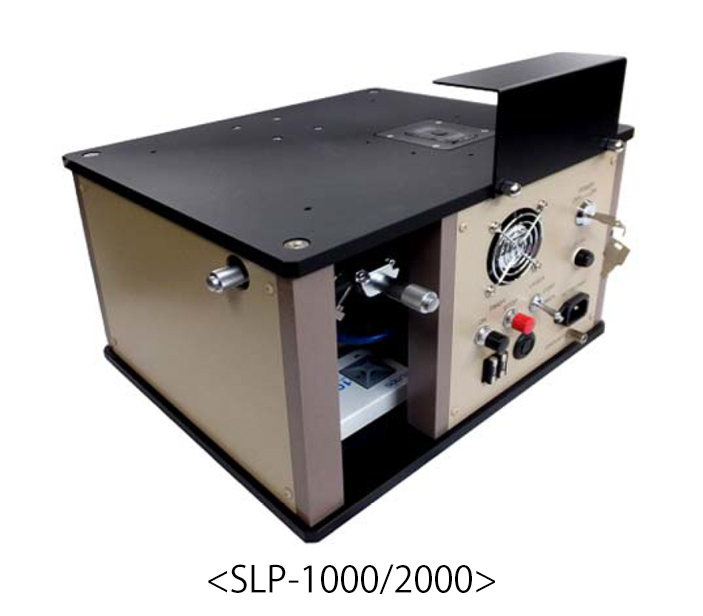 SLP-1000 and SLP-2000 are stress meters measuring compression stress and depth of layer of glass based on Scattered Light Photoelastic method. Stress distribution of chemically tempered glass strengthened by ion-exchanging from Lithium ion(Li+) to Sodium ion(Na+) are evaluated by this method. 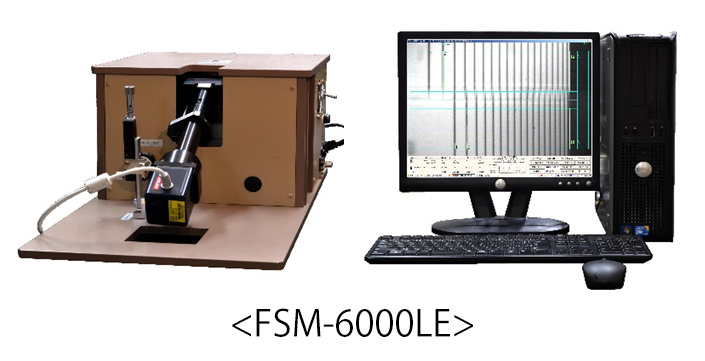 Data obtained from FSM-6000LE and SLP-1000/2000 are combined with the special software. We have just started company blog. Copyright © 2018 Luceo Co., Ltd.